Saquon Barkley has admitted he was sad to see "big brother" Odell Beckham Jr. leave the New York Giants. In a surprising move, the Giants traded the star wide receiver to the Cleveland Browns in exchange for two drafts picks and safety Jabrill Peppers. 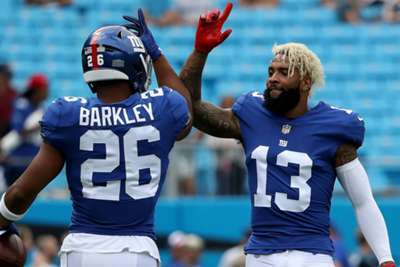 Barkley, who is set to enter his second season as the Giants starting running back, hopes his former team-mate thrives with his new team. "We talked over Facetime, he had just been traded, so I don't think he was really happy about it," he said. Barkley rushed for 1,307 yards and 11 touchdowns in 16 games as a rookie last season after being selected with the second pick in the 2018 draft. "I have to grow as a leader more," Barkley said. "Whether it’s being a vocal leader or leading by example, it's a team effort. "We have to have other players grow as leaders, continue to believe in each other."